Our system combines sophisticated software, trusted partners, and a manual QA process to vet sources and verify leads in real time. Plus, we tailor the leads to your business objectives. The result? High quality, qualified leads that convert into sales for your team, driving greater profits for your organization. RGR Marketing works closely with the following technology partners to perform automatic real-time lead validation. RGR Marketing leverages the Lead Verify product to validate lead data like name, phone, email, and address information, as well as to verify the lead is a real person and can be contacted. Jornaya witnesses the facts about every lead event, and enables RGR Marketing to measure consumer intent, improve acquisition, and ensure TCPA compliance. Forensiq’s advanced technology plus an obsessive team of data scientists help you eliminate impression fraud, click fraud, affiliate fraud and cookie stuffing. 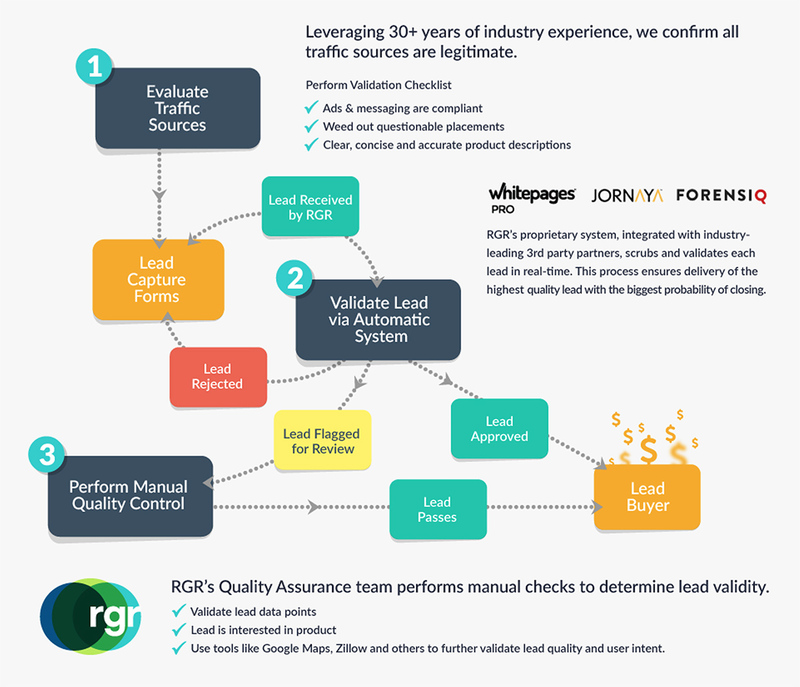 RGR Marketing gives you an ongoing supply of the best possible leads, while Velocify insures sales teams keep pace with the speed of opportunity and improve conversion rates by driving rapid lead response, increased selling discipline, improved productivity, and actionable insights. Mortech’s unique LMS technology supplies features like a user-friendly sales dashboard, real-time rate alerts, constant email marketing geared to prospects’ specific needs. Leadmailbox.com is the “first” web based lead management and tracking system designed for the mortgage industry. RGR Marketing’s strategic partners rely on consistently increasing conversion rates through LeadMailbox.